The title of this post is my interpretation of what ADM James Stavridis, NATO’s Supreme Allied Commander Europe (SACEUR) and Commander of United States European Command (USEUCOM), says in a new TED Talk. To be fair, what he actually says is that strategic communication should be the means by which the partnerships of an open source security strategy will be knitted together. 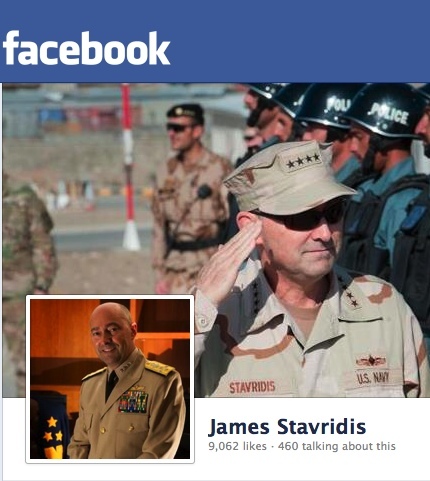 I’ve been admirer of ADM Stavridis for a long time, especially his embrace of social media and public diplomacy (In the interest of full disclosure: In addition to my role as a scholar of strategic communication, narrative and social media at the CSC, I am also US Navy Reserve officer assigned to NATO ACT; my remarks here reflect my own opinions and not those of the US Navy nor NATO). The admiral’s TED talk unites his own personal advocacy for transparency and connectedness in his leadership roles with NATO and US DOD (he has a substantial presence on Facebook and Twitter) with a broader vision of sustainable security efforts globally. In short, ADM Stavridis’ thesis is that, in the 21st Century security environment—an environment dominated by maintaining and ensuring the mutual benefits of the global commons—a security posture predicated on building walls is ineffective and doomed to failure. In fact, one the implications of Admiral Stavridis’ position is that security is not something one state can possess and another state not possess. Security, itself, is a global common, in as much as the seas or cyberspace. Instead of building walls to create secure zones, he advocates building bridges between nations, militaries, NGOs and other organizations. Leveraging a social media inspired philosophy, ADM Stavridis says “no one of us [person, nation, alliance] is as smart as all of us thinking together” and that linking international partners, interagency partners, private-public partners through social media (used strategically) will generate “the sum of all security”. The Admiral’s position is not necessarily new. For example, in a 2005 TED talk military strategist Thomas P.M. Barnett presented a radical notion of dividing US forces into what he termed a “Leviathan Force” (capable of destroying any enemy militarily in short order) and a “SysAdmin Force” capable of securing the transition and peace afterwards. The SysAdmin Force would be only partly military, and depend heavily on interactions with State Department, NGOs and partner nations. In short, Barnett’s SysAdmin Force shares a lot of principles with Stavridis’ vision of an interconnected, open source security. Barnett’s idea is rooted in a historical analysis of the framing of the Constitution that delineates powers to the federal government to “raise and support armies” and to “provide and maintain a Navy” (Article I, Section 8). Barnett suggests the imperatives to win wars and maintain security have always been separated by different goals, methodologies and perspectives. Admiral Stavridis’ approach, however, centers on present day realities of the highly interconnected global society we live and operate within, and the threats to the global commons that come from non-state actors including piracy, cybercrime, trafficking (drugs, weapons and humans) and terrorism. It’s an optimistic vision of the future, sharing in the techno-optimism of much new media rhetoric. The challenge, of course, is how to operationalize the philosophy. Militaries tend to pigeon-hole “strategic communication” as a reactionary tactic—it’s what you do after a Qur’an burning or corpse desecration or off-target missile attack. It’s something that the Public Affairs or Information Operations divisions do, not something that is tightly integrated into all levels of planning and operations. But what Admiral Stavridis suggests will require not only that strategic communication planners have a seat at the decision-making table, but that command staffs adopt a communication-centric approach to thinking through strategy, operations and tactics. Furthermore, developing viable, open and frequently traversed bridges (to borrow that admiral’s metaphor) between international, and especially, interagency partners will be key to effectively implementing the philosophy. Additionally, developing a systematic methodology for strategic communication planning within the formalized staff planning process seems like a crucial capability development requirement. This would take the impetus for strategic communication consideration away from the philosophy of a given leader and institutionalize it into command staff processes. Given the difficulties the USG (and NATO) has with narrative (e.g., the frequently repeated “losing the battle of the narrative” refrain that we’ve discussed here and here), integrating narrative thinking into the planning and decision process seems like a logical step. Viewing narrative as a system as we do at the CSC, it could integrate into the highly systematized planning/decision cycle. This would require a new way of thinking, but that’s what ADM Stavridis is calling for in his TED talk–thinking about security in a broader, more integrated way that recognizes the consequences of decisions in particular domains. USEUCOM has been at the forefront of integrating non-military, non-kinetic and partner-oriented actions in the security arena under Admiral Stavridis’ leadership. He cites numerous successes of collaborative security partnerships (beyond solely USEUCOM’s umbrella) such as medical outreach using USNS Comfort and Mercy (US Navy hospital ships) and literacy training for Afghan National Security Forces. These and the other successful efforts are clearly public diplomacy—engagement with foreign public designed to inform and influence, and here that influence is through solving major social crises or improving citizens’ lives in particular ways. Part of the implication of Admiral Stavridis’ TED talk is that we have to give greater recognition to the security benefits of these public diplomacy efforts—that in fact these efforts do more than inform or solicit goodwill, that they in fact generate greater security. The element Admiral Stavridis is most passionate about, and is a leader is his own right, is the leveraging to today’s highly interconnected media platforms to spread the word of these security efforts. Twitter and Facebook provide the most well known platforms, and reach a broad public. But the larger point is that, whatever the platform, when people feel secure, when they see efforts to sustain their security, and when they can participate even in a minor way (think Neighborhood Watch programs that are based on citizen participation and information transparency) in their own security, they are, in fact, more secure. Thus, the communication of the benefits and the realizations of security, as produced by a wide number of actors (international, interagency, public/private), becomes the key integral part of the open source security vision. An open question, however, is whether military organizations such as NATO and USEUCOM (and beyond) can adapt their thinking about communication and social media to the affordances of these media. The contemporary environment of military strategic communication and public diplomacy is one of a rugged landscape. This rugged landscape is a communication environment that shifts rapidly and doesn’t accommodate slow, bureaucratic approval processes for message dissemination. Speed, variety and the tolerance for the occasional mistake are key elements for communication success in this arena, as argued by my colleagues here at the CSC. Based on Admiral Stavridis’ frequency and breadth of Facebook, Twitter, Tumblr and other updates, he’s on board with speed and variety. Can the rest of the DOD and its interagency partners follow? Glad you noticed his comment but your interpretation is completely off. I am one of the oficial IO/SC minds, and I lost the argument in the 1990’s and early 2000’s on the need to actually be firmly rooted in the truth so as to have legitimacy. Strategic Communication only works when you are telling the truth. What t he Admiral really means–and I certainly hope he expands on this–is that there are not enough guns on the planet to repress the 5 billion poor (Howard Zinn, RIP, also said this) and that the only way to achieve security is by providing the dignity and minimal necessaary access to water, food, employment, etcetera. The USA is coming off 50 years of unilateral militarism driven by the congressional-industrial complex, of virtual colonialism with foreign policy driven by ideology instead of intelligence, and of predatory capitalism and financial terrorism led by Goldman Sachs, among others. The USA is now irrelevant to the future in the face of the demographic reality represented by Brazil, China, India, Indonesia, Iran, Russia, and Venezuela, among others. Goverments are now being routed around by three quarters of the global economy, and also are the least informed of the eight information tribes (academia, civil society, commerce, government, law enforcement, media, military, and non-government/non-profit. So yes, he said we need to go open on security, no he did not mean lies at great cost, but rather doing ground truth thiings that actually stabilize and reconstruct. Robert, I’m glad my post piqued your interest, but I wonder if you only read the headline? I wholeheartedly agree that global security will not come from the barrel of a gun–a statement Admiral Stavridis made in his TED talk and a position you articulate in your comment. We’re all in agreement here. Nowhere in my post, however, do I advocate lying. I do suggest, extending from Admiiral Stavridis’ vision of global security predicated on cooperation between organizations and transparency facilitated by social media, that in this arena of international, interagency, and public/private cooperation, a communication-centric mindset will be required. Every action–whether kinetic or non-kinetic–yields a communication outcome. Where we differ, I think, is your characterization of strategic commcommunication as “lies at great cost”–neither the Admiral nor I said that, nor implied that.